This Mark Titchner creation has appeared on City Billboards this month, courtesy of Eastside Projects. It’s a rallying call for grim times. 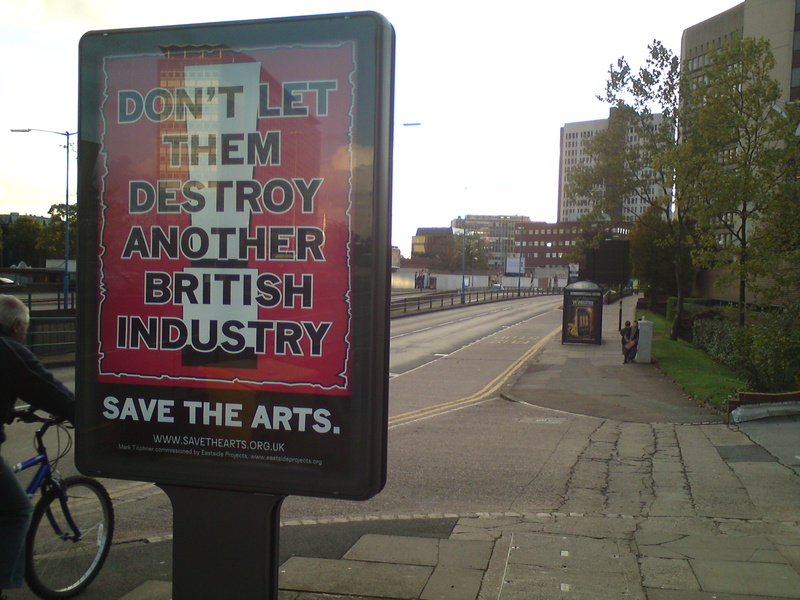 A pervasive air of resignation over the 30% Arts spending cuts may yet turn to indignation, alarm and who knows, action, once the impact is truly felt – provoking a new fervour of politicisation. It’s hard to believe that we may’ve come out of a golden age of subsidy; that we may look back on those times and say ‘we never had it so good’. Depressing also to think that hard work educating the nation in the value of Creativity and the Arts as elemental to social and educational engagement may amount to little once the various Govt. depts re-evaluate their budgets. Arts organisations have been used to trying to ‘diversify their income streams’, but if all of those income streams are cutting back their own budgets, then what hope? I see the Titchner posters pitched up along the Middle Ring-road from Five Ways to Ladywood, a post-industrial landscape rendered desolate from the decline of the manufacturing in this City. Nowadays many of these old abandoned factories are occupied by Arts organisations, who are particularly good at re-animating redundant (but importantly cheap) spaces. Stan’s Cafe started the development process for a new show this week – The Cardinals, which will premiere in February. Suddenly it became VERY cold in the AEHarris Factory. This, as any Stanner will tell you, seems to be a prerequisite characteristic for any recent devising/rehearsal process for Stan’s Cafe. There’s a thesis out there for anyone interested in mapping the aesthetic impact of ‘cold industrial’ on the company’s output. Austerity measures will continue, but take note – creativity will not cease.